I’m full term this Thursday, meaning if I were to go in to labor, they wouldn’t stop it. And while I fully expect another three or so weeks before baby girl makes her appearance, I’m crossing things off the to-do list like mad lately. I’ve got plans for a stop at Babies R’ Us (ugh) this week to use some store credit and pick up odds and ends I need to replenish, and I think next week I’ll start packing hospital bags to be ready. The idea of packing my stuff doesn’t bother me at all; I think I started packing a few things on my due date last go around, and I had all I needed. The idea of packing belongings and instructions for my two-year-old is stressing me out though. I have no idea how long I’ll be gone, and I’d really prefer that he meet his sister at home if I can be back here in the time frame of 24-48 hours, but if it’s longer than that, he’ll come to the hospital. 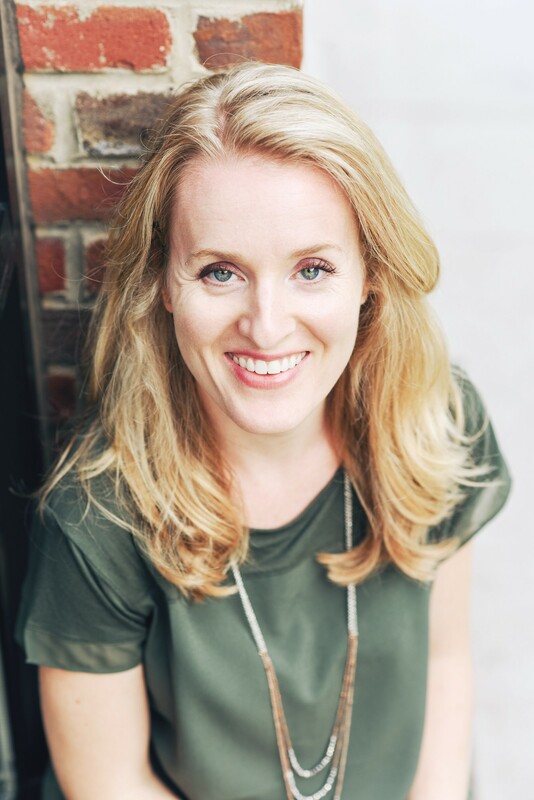 The guessing game of labor and delivery – when it will happen, what time of day, how things will go – is equal parts exciting and nerve-wracking at this stage of the game. This weekend brought some fun things though when I crossed a big one off the list. 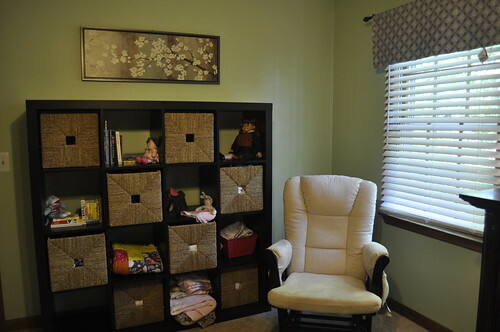 Norah’s room is finished! Take a look now, folks, because I know most of the details and organization won’t look like this in a couple of months when we have a real eating, sleeping, pooping baby living there. That much I remember. 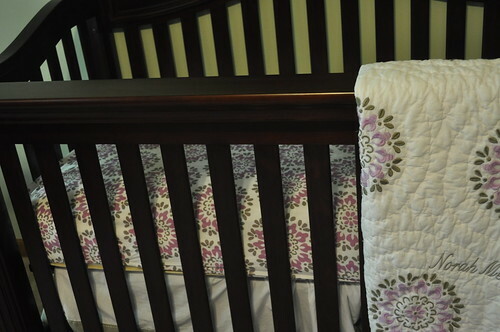 We went with Baby Cache again for the crib and most of the furniture because we loved the one we had for Jude, and we actually are still using his as we’ve converted it to a full-sized bed. It’s served us well, and we found one we liked this time, too. 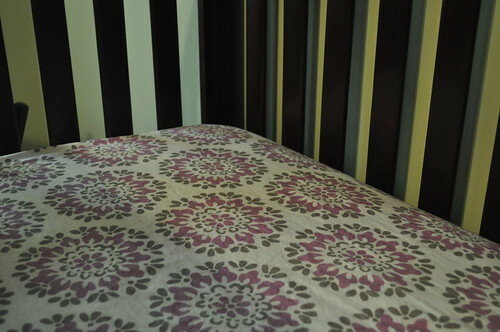 For a long time, I couldn’t fine any bedding I even remotely liked, but then a Pottery Barn sale email landed in my inbox one day, and I settled on the “Dahlia” pattern. We’ve used Jude’s toddler blanket / quilt that came with his bedding as he’s grown older, and I love that it’s a quality item we can keep for a long time for each kid. 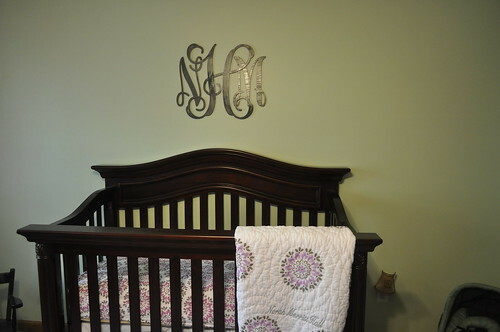 Pottery Barn nursery details make me swoon. So so cute! I also decided (Thanks, Pinterest!) 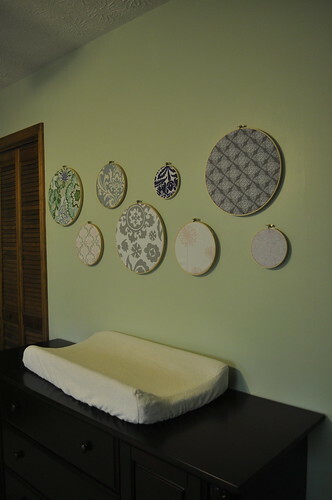 to use various fabric and embroidery hoops to decorate the wall above her changing table. I’m really happy with the way it turned out, and it was pretty inexpensive for a large focal point. A bonus is that I also have some scraps of fabric to use for one thing or another. 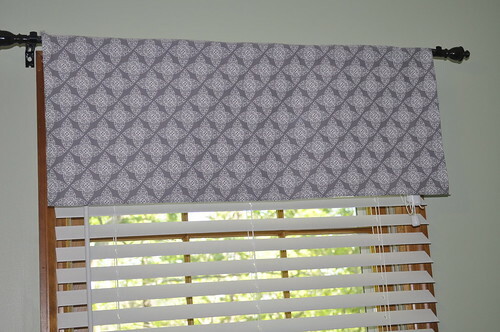 I chose one particular fabric from that wall to carry to the windows, and I made this simple valance using this easy tutorial. 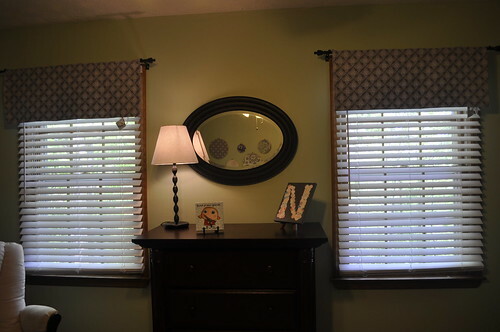 Add a garage-sale find that I repainted…..
And some other details like a mirror we found at Home Goods and an old Ikea lamp that we used to have in the guest bedroom…. 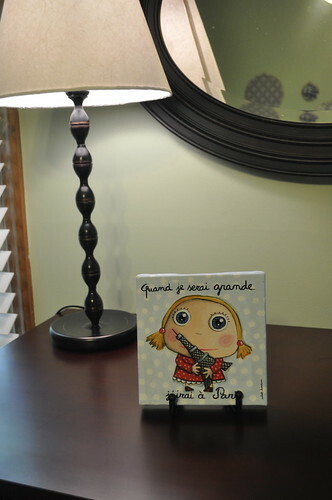 My favorite thing about putting a nursery together is the tiny details that become sentimental. This is the first thing we bought for Norah, just after we found out she was a girl. I found it in a random souvenir shop across from the Louvre on our Paris trip when I was about 22 weeks pregnant. It loosely translates to “When I am grown, I will go to Paris.” I love it and the memories it brings. And then this little project was a mix of a few different Pinterest ideas (mainly this one), and I am happy with the final result. 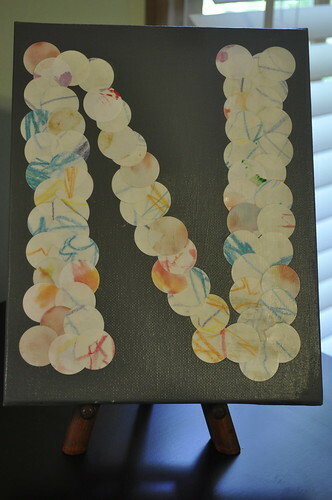 It’s big brother’s scribbles, hole-punched and glued on a painted canvas to form her letter. 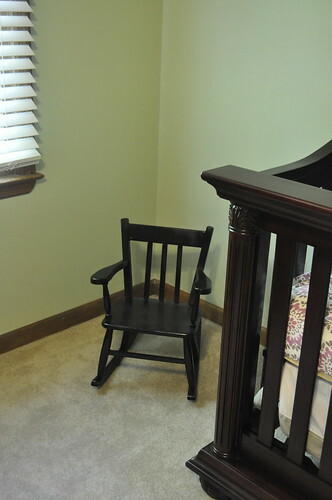 Lastly, we moved the old Expedit shelf and rocking chair from Jude’s room to the nursery. I spent countless hours in this seat last go-around with a newbie, and the shelf became a command center of sorts. The baskets are great for storing burp cloths, blankets, and snacks and such you need as an overwhelmed nursing mama in the early days. And great for faking organization by hiding the mess. All in all, I am happy with the way it turned out. It’s not really all that much like my earlier idea, and I discovered that the antique / dusty sort of pink is pretty much impossible to find. Still though, we used some sprinkles of purple and a little pink to lighten up the green, and I think in the end it’s feminine without being overwhelming. Or so I hope. So that’s the finished project! Drawers full of baby girl clothes, a finished room, and clean sheets on her bed are making me realize we have a new little person making her entrance soon. And that’s pretty exciting. Awesome! Y’all have done a wonderful job. I’m especially smitten with the bedding and Jude’s hole-punch craft. So so so cute and cozy!